For the fourth giveaway in my Giveaway Bonanza I'm offering one reader a FoodStore Carousel worth £70 from Joseph Joseph. 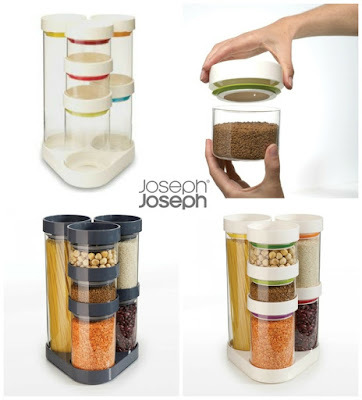 I have quite a few Joseph Joseph products in my kitchen. They're always great quality and well designed. I particularly like my bread bin that has a cutting board in the lid and my colourful nest of bowls, sieves and measuring spoons. My kitchen is so, so small and they are a great space saver and a nice splash of colour too. 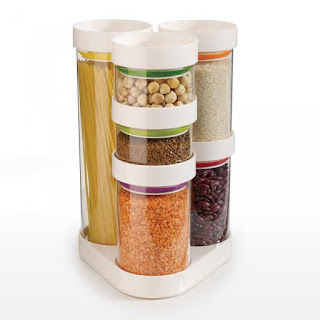 These stylish kitchen storage sets comprise individual glass jars of various sizes that all stack neatly together on their own rotating carousels. 6 large jars perfect for storing dry foods such as tea, coffee, pasta and beans. Made from tough borosilicate glass. All jars have stackable airtight lids that help keep food fresher for longer. Each carousel has a non-slip base and a smooth, rotating mechanism, making every jar easily accessible. Both units fit neatly onto a kitchen worktop or inside a cupboard. Leave me a comment and use the rafflecopter to enter. This giveaway will run a little longer than my other giveaways and will close on 8 January 2016 and is UK only. I have always wanted one of these! At the mo, all my spices are kept in my cupboard but would look lovely on display! love this - would love to win! That's a pretty handy storage thingy! oh! being in uni and having so little space these would be a lifesaver! Joseph Joseph does some lovely kitchen things, we could find room for this one. What a great way to store spices. An asset to any kitchen. This is a great idea,I've not seen one before. The stacking storage units look great, I didn't see them before. Me and the hubby keep looking for storage options but never really considered round containers! So very useful - a great way to increase storage. fabulous giveaway, so handy thank you for the chance. This is definitely something I would want to have in my kitchen! Love it how the jars stack up, saving space. I really wish I win this! Thanks for the opportunity. How have I never heard of these - they look so useful! That is so beautiful - just getting first home and would love this!! These look so handy and practical - great idea! 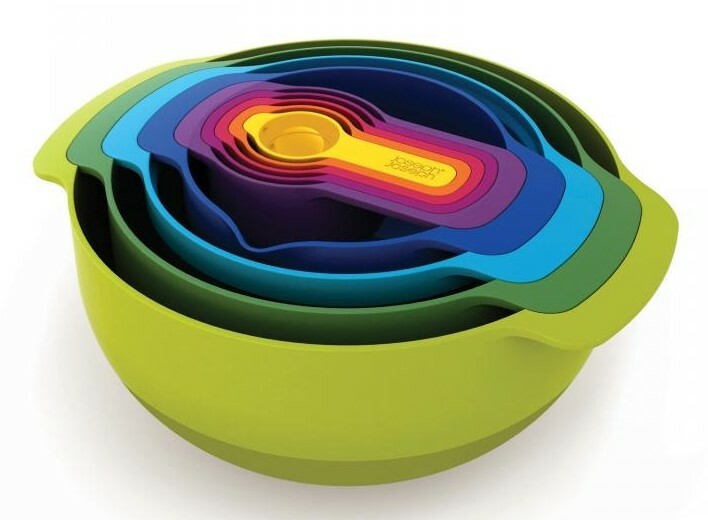 I love the colourful bowls. This is really nifty, would be so useful. I love Joseph and Joseph products, they're so innovative. I've started to add pieces, one by one, to our kitchen! I hope you had a really great Christmas!! I have spices in all different jars. Would be lovely to have them all together on display. Thanks Jacqueline. I have all my spices in different shaped jars. Would be great to have them all in one place, to hand and on display. Thanks for the chance, Jacqueline. It looks great and would be really useful to help keep things neat and tidy. These are great! Definitely help with organisation! This would look great in my kitchen! I love this brand, such clever and innovative products. Great storage, would look fab in my kitchen. Fantastic giveaway, I love Joseph Joseph products! Love Love Joseph Joseph products. This would be very helpful as my aim is to declutter this year.